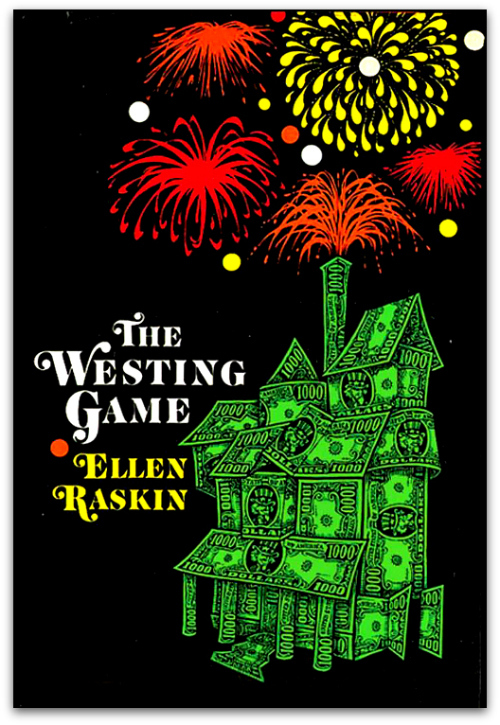 Shopping for a gift for my 10-year-old goddaughter last week, I stumbled on a copy of one of my favorite books from when I was about her age: Ellen Raskin’s 1979 novel The Westing Game. And re-reading the mystery before wrapping it up, I discovered just how delightfully singular this Newbery Medal winner really is. For one thing, it’s a children’s book without an obvious child protagonist. Yes, 13-year-old Tabitha-Ruth “Turtle” Wexler plays a central role in solving the puzzle behind paper baron Samuel Westing’s $200 million estate (and apparent murder). But unlike most contemporary books for young people, The Westing Game isn’t told from her point of view alone (or even mostly). And for much of the story, she’s less a relatable, screen-ready heroine than a pigtailed, shin-kicking brat. Yes, Westing’s 16 presumed heirs/suspects include a few other teens — the wheelchair-bound birdwatcher Chris Theopolis; his older brother, Theo; and high school track star Doug Hoo. But most of the characters/suspects are (nominally) grown-ups, behaving in the way that kids imagine grown-ups behave — with rich inner lives or secret backstories just waiting to be revealed if you could only just scratch the surface. Turtle’s podiatrist dad is also a bookie; secretary Sydelle Pulaski is a lonely drama queen who fakes needing crutches for attention (until an accident prompts a real need for crutches); cleaning lady Berthe Crow also seems to run a soup kitchen; and dressmaker Flora Baumbach still mourns the death of her daughter (described, in an anachronistically off note, as “Mongoloid”). In other words, this is a children’s book that doesn’t just concern itself with kids’ stuff. And far from banishing grown-ups to the periphery, as so many modern YA books do, The Westing Game offers a peek into adult life with some genuine real-world stakes: a murder, bombings, a multimillion-dollar fortune. But it’s the kids who seem to have the most curiosity and gumption to do the legwork as, well, bubble-gumshoes. Doug Hoo (literally) runs after suspects; Theo follows them on his bike; Turtle even induces her grown-up partner to play the stock market. In terms of cracking the case, youth is more of an asset than a handicap. Thirty-five years on, The Westing Game can seem a tad dated (and not just because of that unfortunate reference to Down syndrome). One heir taps newspaper buddies and a private detective to dig up info that would be easily accessible on the Internet today. Another, Turtle’s 20-year-old sister, drops out of college after getting engaged to a dashing 25-year-old medical internist (a career- and life-forgoing decision that probably seemed old-fashioned even in the late ’70s). And Turtle follows an old wives’ tale to treat a toothache with a bourbon-soaked cottonball. But for the most part, The Westing Game continues to work its magic. I was hooked all over again by Raskin’s wordplay and the ingenious structure of her puzzle-like plot. (In this regard, she’s a worthy successor to Agatha Christie — but she also anticipates blockbuster scavenger-hunt writers like Dan Brown and Steve Berry.) My biggest takeaway, though, and what I remembered loving as a kid, is how the youthful characters are treated without condescension — or segregation into some teen-only setting. They’re allowed equal (sneakered) footing on a grown-up playing field, and they more than hold their own.